A wonderful celebration of Tony’s life was held in St Leonard’s church on March 1. The church was packed with 350 people from all over, as well as Watlington. His long and varied life was always centred on people and there were many tales shared and enjoyed after the service – for which he had, himself, planned and left detailed instructions. In 1960 Tony became the first Anglican priest to be ordained while in factory work, seeing his job as a forklift driver in a car factory as his Christian calling. A lifelong activist, he was one of Britain’s leading “worker priests”, a Labour politician, lord mayor of Oxford, and trade unionist for more than 60 years. Tony always acknowledged his religious approach during his 59 years as a priest was not deeply theological but rather rooted in a Christian Socialist drive to make society a better place. The second half of his priestly ministry was served in Watlington. After Tony and his wife Barbara moved from Cowley in 1989 he threw himself into many aspects of Watlington life. The projects Tony was involved with – too numerous to list – would have struggled without his boundless and energetic input. Easy to spot in his bright yellow jacket and yellow-and-black Mini, he was a force of nature around the town. 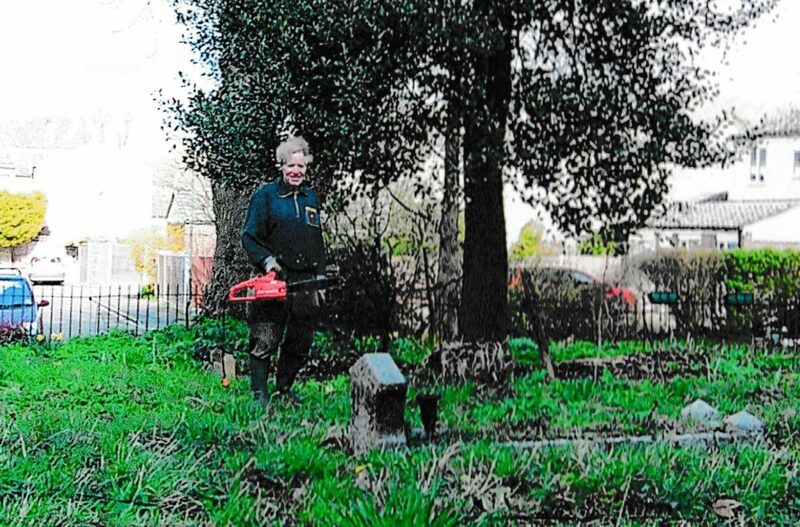 Tony was always very practical, clearing mountains of brambles from the churchyard and documenting the graves underneath, and organizing the community payback teams working in the town. According to those he worked with in Watlington, Tony’s style was to consult widely while also having a clear vision for the project at hand. He was also determined, even stubborn, in persuading others involved of the best way forward. 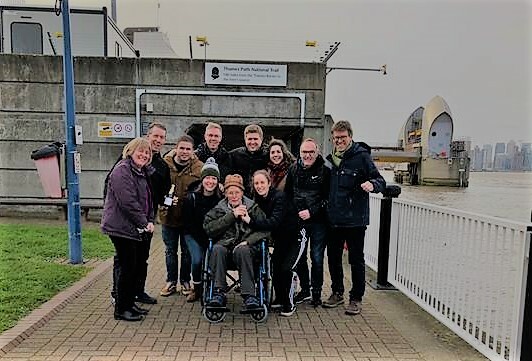 This approach was honed during Tony’s decades as an Oxford politician and trade union negotiator but was rooted in something deeper: his lifelong Christian commitment to reach out to ordinary people and helping them however he could. Tony – Anthony William Williamson – was born in Fenny Drayton, Leicestershire on the 2nd of September 1933. He was the youngest of three children of Joe Williamson, an Anglican minister, and Audrey (nee Barnes), a nanny. His father campaigned in the 1950s in east London to clear slums and open refuges for prostitutes, and Tony inherited this instinct for fighting injustice. Tony joined the Parish Council soon after moving to Watlington, chairing it from 1997 to 2004 and remaining a member to his death. Among other Watlington projects he was chairman of the Governors in establishing the new Primary School, opened in 2000, providing invaluable strategic guidance and knowledge of local government. Always well briefed, Tony had been a housing expert on Oxford city council for more than 20 years. In 1977 he was appointed OBE. He became Oxford council leader and joint leader of Oxfordshire county council. In 2017 the Council made him an honorary alderman, its highest honour. As Lord Mayor of Oxford in 1982-83 he pursued his worker priest approach despite the pomp of the role, clocking in at the factory at 7.15am every morning and prioritizing mayoral visits to municipal rubbish collectors and other less glamourous professions. In recent years he has been a driving force in the planning of new housing here in Watlington. After her severe stroke in 2011 Tony became a full-time carer for Barbara. He learnt to cook and care for her and they remained active together. He was involved in Age Concern, in managing the town hall and in trade union work. After Barbara’s death in 2015, Tony, aged 83, remarried, finding happiness with Jill Sweeny, a local family friend. Jill died unexpectedly in 2018. Tony had been diagnosed with prostate cancer. He died peacefully at home on February 12. He is survived by his four children Ruth, Paul, Hugh and Ian and eight grandchildren. SNOW DROP WEEKENDS ARE HERE AGAIN. For three weekends in Feburary 9th/10th. 16th/17th and 23rd and 24th 2 pm to 4pm. 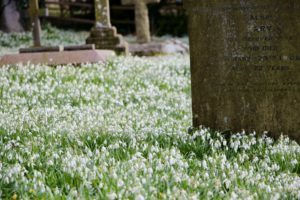 our special church and see the lovely snowdrops in the churchyard. We can also never get enough potted snow drops to sell. If you are interested in reading the annual report please follow the link below. We would be most grateful if this information could be passed on to a anyone who would be interested in helping. Our delightful country church is in urgent need of an organist. Our regular Organists and Choir Mistress (a married couple) have just retired after many years of faithful service at St Botolph’s Church, Swyncombe: a well-supported (nearly) 1,000 year old church in a delightful rural location. Unfortunately, we have been unable to find a replacement regular organist locally. Do you happen to know of any organists keen to play on a very good small organ in a charming country church, either on a regular or occasional basis? We would, of course, pay for this service. Our Sung Eucharists are held every Sunday at 10.30am. While finding an organist is very urgent, we should, ideally, also be keen to find a Choir Master/Mistress, if one became available at some point, for our dedicated Choir, who sing for us several times a year. As we are now completely without a regular organist any assistance will be gratefully received. The Reverend DANIEL THOMPSON will be ‘Instituted’(i.e. licensed) at a special ceremony at St Leonard’s Church, Watlington. He will then become Rector of the Benefice of Icknield, which includes the parishes of Watlington, Swyncombe, Pyrton and Britwell Salome. Bishop Colin (Bishop of Dorchester) and Archdeacon Judy French (Archdeacon of Dorchester) will officiate. Everyone is invited to attend this ceremony and to stay for Refreshments afterwards. Our new Rector, Rev’d Daniel Thompson, will take his first service in the Benefice, at St Botolph’s Church, Swyncombe’s ‘SAID EUCHARIST’ Service. Rev’d Daniel Thompson will take the ‘SUNG EUCHARIST’ service at St Botolph’s Church, Swyncombe. Please do join us to formally ‘Welcome’ our new Rector to St Botolph’s and to enjoy some Refreshments afterwards. We all enjoyed Bill Bailey & co’s visit to our church last Wednesday on a very wet, miserable day. He was walking 100 miles on six days in aid of ‘Stand up to Cancer’. He originally did this two years ago, apparently, as his mother had died of the disease. His ‘entourage’ in fact comprised a very cheery bunch of close friends and family. 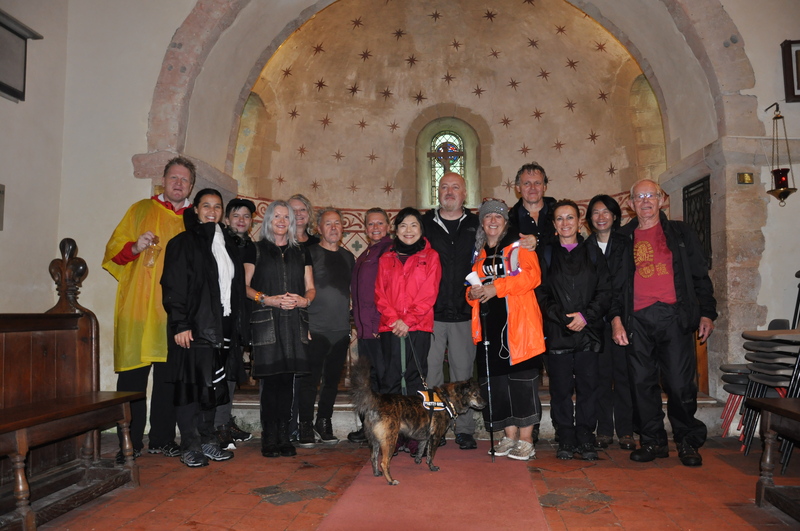 Some friends had come from Australia and Bali specifically to join Bill in the Walk. He should finish the Walk tomorrow night (Sat 29 July). The Henley Standard covered the visit with an article in their July 28th edition. COMEDIAN Bill Bailey dropped into St Botolph’s Church in Swyncombe on Wednesday. He was taking part in a 100-mile walk along the Ridgeway in aid of Stand up to Cancer when he made his stop. Bailey arrived with about 15 walkers, including his wife Kristin, just before …. continue. 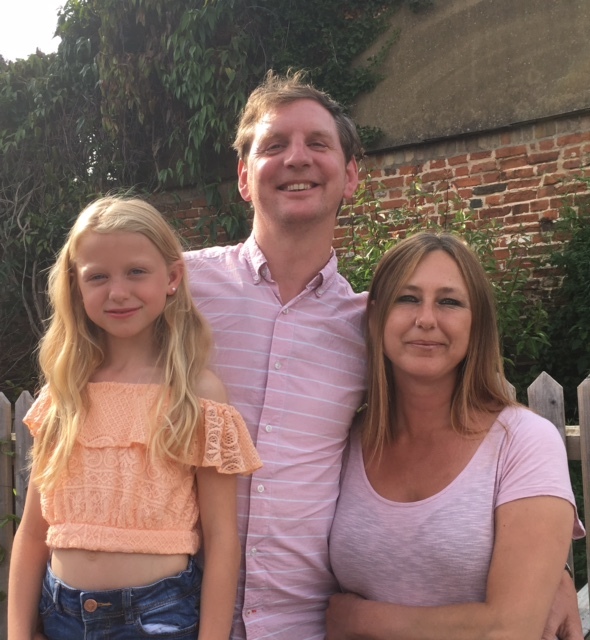 We are delighted to announce the appointment of the Reverend Daniel Thompson as the new Rector for the Parish of Swyncombe and also the Parishes of Britwell Salome, Pyrton and Watlington. Reverend Daniel will formally join us on the 5th of September. We look forward to welcoming him together with his wife Jo and daughter Matilda. There will be plenty of time to get to know Daniel, and his family when they move here. By way of early introduction Jon Barton did a brief phone interview with Daniel to ask why he wanted to come here. Below is Daniel’s reply. ‘’Because there’s such potential. I was blown away by Watlington Church and what you’re trying to do for the community. And in all four parishes, the people involved love and care so much for their churches. Being a priest today isn’t about managing decline. The tide is changing. And I love the parochial model – it’s the great strength of Anglicanism. I was brought up in a rural parish outside Salisbury, singing in the choir at 6, ringing bells at 8. I know it sounds boring, but I knew I wanted to be a priest from when I was a child. As a teenager all I wanted to do after school was to study theology and get ordained. But it didn’t work out like that. At college it all fell away. I’ve a questioning brain and love philosophy. I explored atheism and thought Richard Dawkins was the best thing ever. The irony is that I never lost my calling. In my thirties I did a master’s degree in philosophy and studied many interesting thinkers. They started to lead me on the road back. Getting married in a church had a massive impact, sensing we were part of a bigger story. It felt amazing to come back to faith. That experience helps me as a priest. One big problem for the church is not understanding people who think differently. It’s something I recognised every day as an RE teacher before being ordained. We just throw things at people and wonder why they don’t pick them up. That’s why I’ve been bringing groups of adults who don’t share our beliefs to talk together. I’m so lucky now – I’m doing the thing I was born to do. I love it. The hardest thing is to make so many switches in a day – from school assemblies to intense funeral visits, from parish meetings to bumping into someone in Tesco’s who feels suicidal. I believe very strongly in my priestly calling. I’m a traditional priest with an open-minded approach. The church isn’t about dogma. Jesus didn’t write a book – he brought himself. Being a priest is about being a presence in people’s lives, someone who can make Jesus known to others. There’s a real need for that, and that’s what I can offer. But it means building trust, and having the patience to listen to what people are searching for, not trying to impose solutions. The kingdom of God isn’t just about worship; it’s about how we live our lives. The whole idea of the medieval church was as a centre of the community, where the spiritual and physical needs of a parish were combined. I think we need to reclaim both elements to make churches sustainable for the future.